Beetroot Detroit 2 is an organically grown, delicious earthy flavoured and beautiful beetroot variety. These beetroots have a dark red outside and a darkred inside. Beetroot originates from the Mediterranean Area. 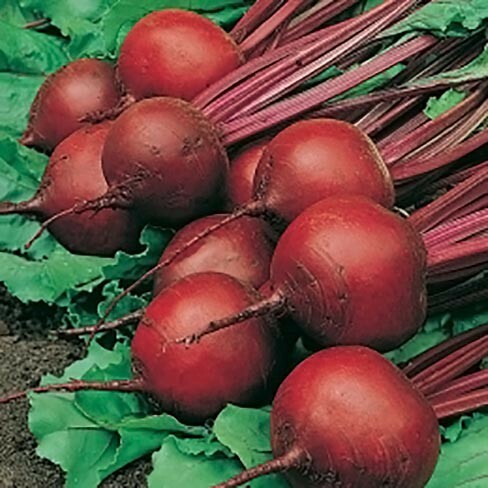 They're also called table beet, garden beet, red beet and golden beet. In Russia they eat Borscht (beet soup) and this is made of the beetroot and the leaves. You can keep beetroot very well and for a long time. Beetroot can be grown in almost every soil. This is a summer beetroot variety. Beetroot is very healthy and versatile. They contain a.o. : vitamin B1, B2, B5, B6, B11 and C. And the minerals: sodium, calcium, manganese, potassium, iron, phosphor, copper and zinc. Also a lot of fibre, betanin and very little calories. That's why beetroot is very healthy. You can also eat the leaves of the beetroot. You can chop the leaves finely and add them to your dishes. But you can also stir-fry the leaves whole, use them in salads or add them to you dishes. You can cook, prepare them in the oven, eat them raw, bake, steam, stew, pickle in vinegar and use them in soups and mashed potato stews. Beetroot is delicious with: apple, potatoes, lettuce, onions, carrots, garlic, lemon, oranges, cheese, sour cream, nuts, chives, gherkin, rucola, corn salad, spinach, beef, eggs, chicken, minced meat and bacon. Hardy annual. Sow outdoors from the middle of April till the middle of July, when there's no more any danger of severe frosts and the soil is warmed up. Sow on a sunny plot with loose, freedraining soil. Remove as much stones as possible to give the roots a good chance to grow deep in the ground. Sow for a longer harvesting period, small amounts approx. 2 - 3 weeks from eachother. Soak the seeds prior to sowing in tepid water for ½ - 1 hour to help the germination. Sow in rows approx. 30 cm apart every 5 cm 1 seed. Germination can take 7 - 21 days, depending on the weather and temperature. From each seed germinate about 3 seedlings. Remove all weak seedlings till 1 strongest per hole remains. Thin the seedlings, when they're approx. 5 cm long to 10 cm for little round beetroots and approx. 15 cm for larger elongated varieties. Beetroot needs a lot of water during the growth, give enough water during dry-spells. Protect the beetroots against birds with nets. Harvest the beets when they're still young. You can harvest when the leaves begin to hang. Cut the leaves approx. 5 cm above the root to prevent bleeding and rotting. Eat your beetroots right after harvesting them. But It's possible to store them in a cool, dry, dark place in closed containers. Put the beetroots in layers and put some sand between each layer. This way you can store them for about one month.